When your document jobs need to be done on time with a great print quality, the Konica Minolta Bizhub 4050 is ready to work faster and better for all your document tasks. The Bizhub 4050 printer also features mono copier and color scanner. With a 7-inches color touchscreen display as the main control panel which allows you to easily control and operate the machine like using a tablet. 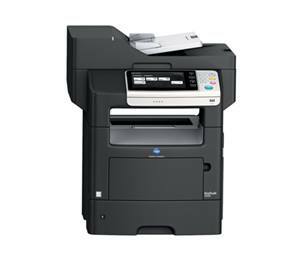 The Konica Minolta Bizhub 4050 can do your document jobs faster with speedy print performance. The print speed can reach up to 42 ppm in a legal-size paper. The Bizhub 4050 also delivers a high-definition monochrome print quality with maximum resolution up to 600 x 600 dpi. There is also an automatic duplexing for two-sided printing in order to give you a low-cost running. You can also directly print from your convenient devices using AirPrint and Google Cloud Print. The Konica Minolta Bizhub 4050 brings a 650-sheet tray which is divided into a 550-sheet cassette and a 100-sheet multipurpose tray. There is also a 50-sheet Automatic Document Feeder (ADF) tray for scanning. It has the maximum paper capacity up to 2,300 sheets with various paper weights from 60 to 163 gsm. The printer interface uses two connectivity options including a wired connectivity using USB port, and network connectivity using Ethernet. Scanner: Konica Minolta Bizhub 4050 Scanner Driver ⟹ Download (5.2MB) – Download x64 (5.8MB). Find the Konica Minolta Bizhub 4050 driver that is compatible with your device’s OS and download it. On your device, look for the Konica Minolta Bizhub 4050 driver, click on it twice. Locate the Konica Minolta Bizhub 4050 driver. Press on the “Uninstall” button.